At Videxio we don’t put up with second best, and neither should you. That’s why we make sure our cloud video service saves you time and money. Here’s how. 1) Did someone say group licenses? The best things in business are flexible, including us. Our fully customizable subscription models let you start small and grow big, meaning you’ll never outgrow your plan. So whether you’re a one-man-band or an international corporation, we’re guaranteed to have something that fits your business down to a tee. We have both individual and group licenses. Group licenses also helps you save money, meaning your whole company can make the most of videoconferencing without breaking the bank. Software setup: the bane of IT departments the world over. And for good reason – complex software solutions aren’t known for being particularly user-friendly. So we’ve done something different. From installation to sign in, we’ve made sure the Videxio experience is as slick, simple and intuitive as possible. Once you’re set up, all it takes is a couple of clicks to launch and join a video meeting – simply sign in through the MyVidexio web portal to enter the meeting room. On mobile? No problem, just download the dedicated My Meeting Video app for secure, HD video on the go. Videxio is an OTT (over-the-top) service, a cloud service, and a VCaaS (videoconferencing-as-a-service) provider. Phew, quite the mouthful. But put simply, it means you can enjoy all of our services through your existing internet connection. And with the cloud comes even more benefits. Not only does it let you access a great video connection anywhere at any time, but it also means there’s no need for any extra capital expenditure or infrastructure upheaval. In other words, Videxio is an investment for the future. 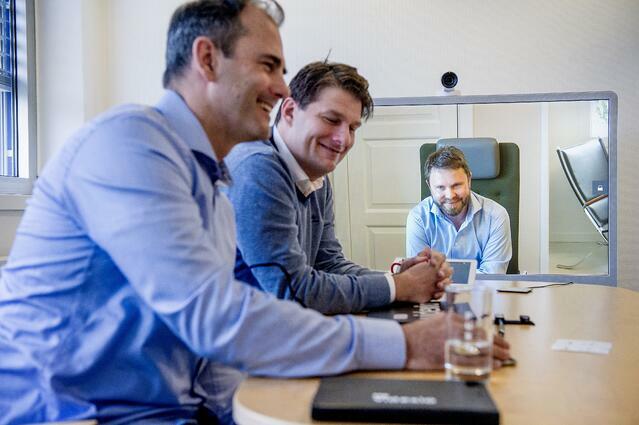 With Videxio, video meetings are never complicated. Our mantra is simple: if you have an internet connection, you should have access to high-quality video regardless of the device you’re using. To guarantee that happens, we have data centers all over the world, allowing us to switch every call onto a dedicated video network. So whether you’re using a smartphone, PC or tablet, your connection will always have the quality of a local call. And the best bit? There’s no need to throw away your existing videoconferencing tech. With our dedicated subscription service, you can make unlimited HD video calls to any SIP/H.323 address using your purpose-built videoconferencing systems. 5) Participants dialing in from different devices? No problem. It can be hard to keep up with the constantly evolving array of devices, platforms, and networks out there. But with Videxio, you don’t have to. Thanks to the cloud, you can seamlessly connect to everyone, no matter what device or platform they’re using. So how do we do it? Well, the answer is in staying flexible. Participants have the choice to join a videoconference from a web browser, a standards-based video system or from Skype for Business. If that wasn’t enough, they can even dial in on audio from a phone. All of which means one thing: you can host, invite, and join video meetings in seconds, and invite almost anyone.